It's been cold all over already this winter but there's a sunsplashed slot game at Liberty Slots Casino that's heating things up. The new Mayan-themed slot game, Gold of the Gods, has been a big hit since it made its debut last month. It's been played so much that in its first few weeks it’s paid out over half a million dollars! Gold of the Gods is a 25 pay line game with bets from as little as a penny up to $5 per pay line. The new slot game from Wager Gaming Technology has a progressive jackpot of over $800,000. Taking its theme from the sun-worshipping civilizations of Central America, the new game offers up a myriad of riches for slot players. It features an elaborate bonus game awarding free games and multipliers. The Gods have obscured the Sun with an eclipse. Players select objects as offerings and, when the gods have been appeased, are rewarded with credits, free games and multipliers. 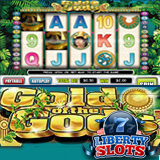 Liberty Slots offers more than a hundred slot machines including Dragon Master, Hot Roller and Amanda Panda and the Jackpot Journey as well as classic casino games like roulette and craps. The online casino welcomes players from around the world with a $777 Welcome Bonus.